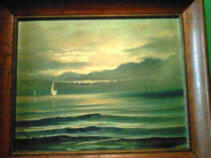 Information and news for collectors of arts, pictures, paintings, sculptures, prints, drawings. With values of arts. 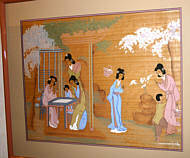 It is a very interesting hobby to collect paintings, prints, sculptures and other arts. Here you will find an overview of interesting links about art in the Internet and you can publish your own question or message about art. Are you looking for books and more about art? If you have a question or you want send us a message about collecting of art be published here then send an email to us. Readers who can answer a published question should send the answer to the email address of the person who asked. :-) Thank you. I found two �older� frames prints. 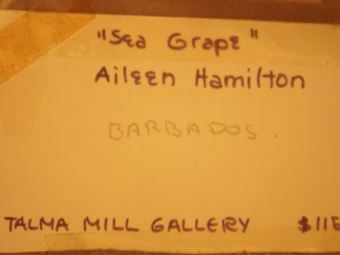 On the back of the frame is a label from your company and it reads as follows: 1966 Old Woman of Capri, and another 1966 Old Man of Capri. Are these worth anything, what can I do with them? I appreciate your anticipated attention to this matter. Hello, my name is Lubos Jancek, I am from Slovakia. 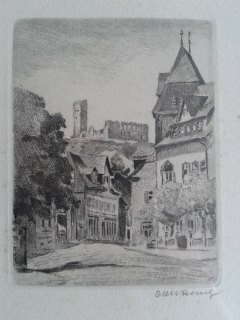 I have the old etching signed by unknown German or Austrina artist. Can you help me with his identification? 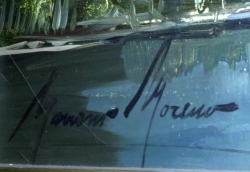 Photos of etching and signature are attached. Could you please tell me if any of these are familiar? Hi, I have about 250 original American political caricatures which were published in the 40-ies 50-ies 60-ies and 70-ties from Senich, Ed, Bill Crawford, Draper Hill and many others. I would like to sell them. Could you give me some advice, which is the best way to realize this? 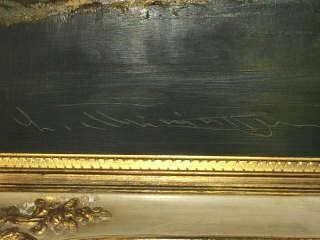 I have this painting the person that sign this is A. Curtis do you know anything about him? 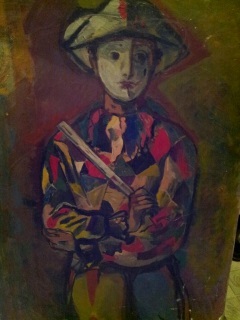 I have an original oil painting by Mariam Sommurt or something like that. Found him years ago but now I can't goggle him. 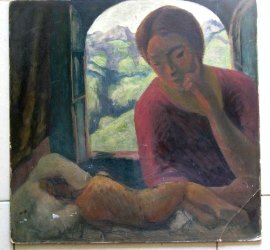 The painting is of a woman in a green dress sitting/reading. I recall that he was an apprentice to a more recognized artist. When I goggled most everything came up in German I believe. I saw his work one that looked like mine and another similar woman. I think there was also a picture of the outdoors with a building or something. 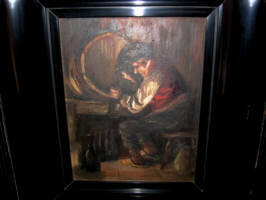 I would like to sell the painting and was thinking there would be more of a market in Europe but I can't seem to get back on that website. It took me forever to get the name and now I wonder if I am misspelling it? Spellcheck always spelled for me before. Where is spellcheck now? Any help would be greatly appreciated. 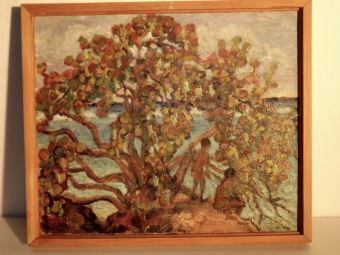 Hi, I have an original oil by Aileen Hamilton of Barbados, purchased sometime in 1960�s by my mom. 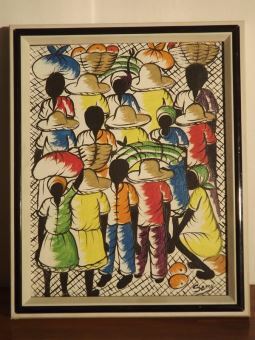 I have info on her being one of the pioneers of artists in Barbados, but have no idea what this painting is worth. 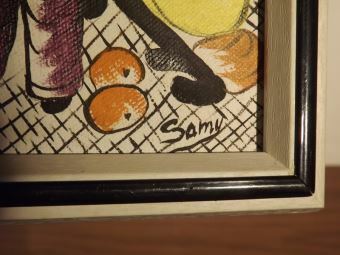 Also, I have passed down from my mom, a painting signed by �Samy�, that I know nothing about. I know it is also from the Caribbean but don�t know what island. Jamacia ? Haiti?, they traveled all over. Can you tell me where this one is from, a little about SAMY and it�s worth? W. Richter art do you have any info? 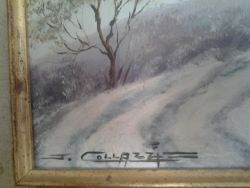 Good afternoon, I have a Joseph Collazzi painting of an Italian streetway (I can send you a picture of it tomorrow). I have been trying to find out more information about the artist and today I found out that the artist always signs on the bottom left of his paintings BUT my painting is signed on the bottom right. 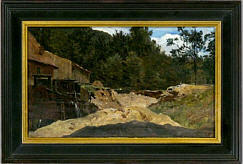 The painting is framed and approximately 8.5" x 11". 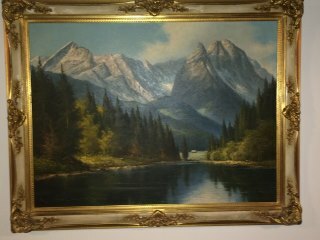 I was wondering what my painting was worth but I guess it would be better if I were to send you a picture of it first. If you could give me a guestimate that would be great if not I will wait until tomorrow after you have seen a picture of the painting. Also, if there are any art appraisers in the midtown NYC area that you know of that I could take the painting to get appraised that would be very helpful. Thank you very much for your time. 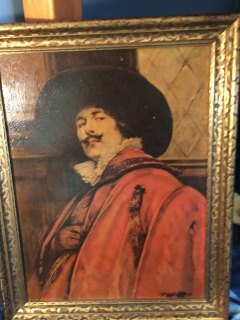 I have this painting and was wondering if you could help identify it. Im willing to pay for any help. 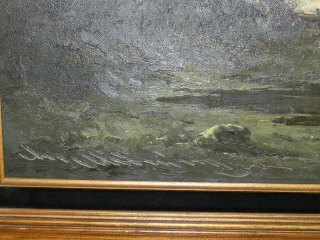 The painting is ruffly 2'*3'. 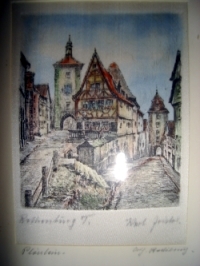 sammler.com: Yes, these are pictures that show buildings of the city of Rothenburg ob der Tauber! 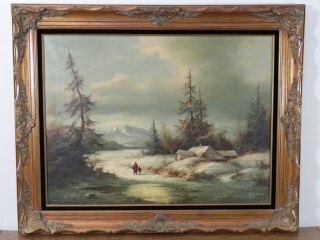 I am looking for information about an artist named Guy. I have a picture titled " Des Bubles by Guy" and would like more information. 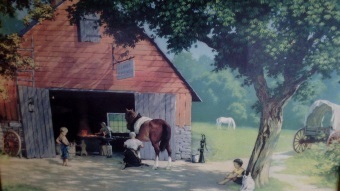 a lady named liz called me about buying my paintings by joseph collazzi. i gave her your email address so that she could call you.seams like there is a small gathering of joes fans about. i hope so. he is to wonderful to go to by. catherine dunbar. 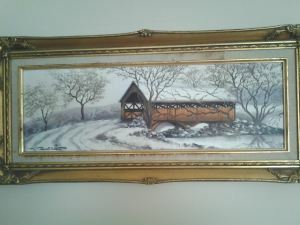 I have two of his works,the subject's are farming scenes they are done in soft browns and beige if you find out any information please let me know. I thank you for any aid in gathering information about the aforementioned artist. ... would love to share it with you. Also have two beautiful paintings i bought 25 to 30 years ago from the Mystic arts festival. paintings are famous italian street scenes. they are not for sale. have crippled arm so find it difficult to write Collazzi history but will copy and mail it to you could you. send address to c dunbar 329 pumpkin hill rd ledyard ct. 06339. area code 860 536 7076. i am new to internet, hope you get my messages. Hello! An e-mail was previously sent to you ( Its a little boy wearing a red jacket with a white collar. The Little Boy Is holding a dog and there is a top hat on the ground (12/04/2007) ...). My mother in-law recently passed away & I found the same print of the little boy w/red jacket holding the dog. Can you tell me if this is 1/2 of a set? Is there a matching print with a little girl? Is so, is there a way to order/purchase it? My husband seems to think there is. BILIOTTI He was born in Naples, Italy, in 1921 and studied at the Academy in Naples and also in Rome under Professors Salvati and Mormone. 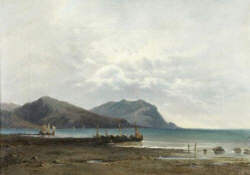 He has had numerous exhibitions, both one-man and collective, and has been very popular in the Art Colony in Florence. He is very versatile and his fresh appealing style has been well accepted in Europe. He is currenly enjoying a rapidly growing popularity in the United States where his paintings are in private and public collections. I can't find out ANYTHING about the artist. Any help would be much appreciated. 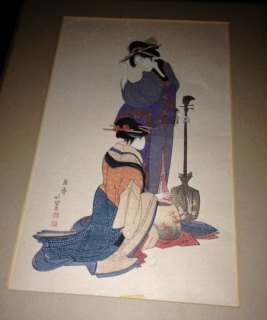 My mother recently passed away and I found a large framed lithograph of "The Chess Game" by F.Beda. 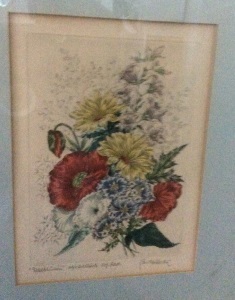 The frame is gold and gaudy and the lithograph is held in the frame with nails. In the lower left corner of the print it shows MORRIS & BENDIEN INC., N.Y, 1910. 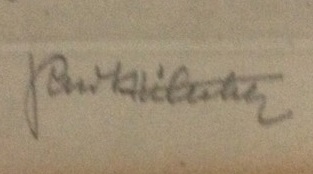 The print also looks like a signature is on it, but I dont think it is an original signature. 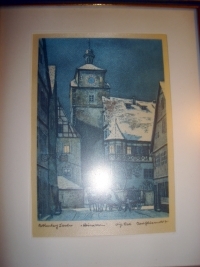 I see posters of this print sold on the internet today and it doesnt appear that they have the signature of F Beda on it. Would you have any idea what the value of this might be? 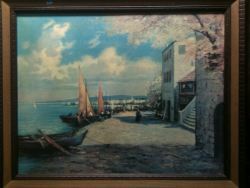 I have an original Hermann RUDISUHLI print in original frame, It is of a woman sitting on a larde trelace over looking an ocean has peacocks beautiful flowers, water fountain trees, large pillars, can you tell me the name it is I believe an original work. Thank you I can send photo if needed. i have a Tiffany Favrille signed lamp/lighting fixture globe, about 18 " high, very good condition but no electric light base for the globe. Any idea of the price? I have been told it is genuine. 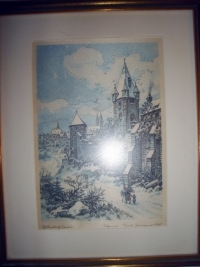 I have Charlotte and Peter, Sydney Bell 1923 framed prints. Any thoughts on their value? I have a 1953 Men's Rolex Tudor Prince watch, working and being used daily, any value on this? I have a 36 " glass sail boat, signed Daum Nance, genuine also, Value? 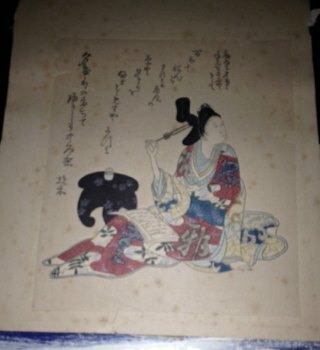 I would appreciate if you could send me some information about this picture. Yours Truly H.Sch. We will publish this information here. August von Munchhausen born in Germany lived in the 40s in New York City. The main motives of his pictures were dancers and ballet drawings. 1931 First journey to the U.S.A.